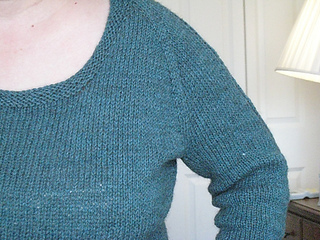 This fitted raglan is worked from the top down, starting with a garter-stitch neckband. It has a scoop neck and full-length sleeves. Increases for the raglan shaping are made on either side of a 3 stitch raglan “seam”. There is also ribbing (an uneven double rib) down the center of the sleeve, a fake waistband, and a “skirt” below the waistband using the same uneven double rib. Thanks go to the Free Pattern Testers forum on Ravelry for making the pattern much better than it would have otherwise been. Row 2 (on page 2) -- “sm, p to beginning of round marker, sm” should just be “sm”.